A feather duster is a cleaning device that uses bird feathers (certain feathers from a small number of species are preferred) to remove dust from objects. High quality dusters use feathers from the outer layers of an ostrich's feathers. Each has a quill (a hollow spine) near on edge of the feather and a fringe on the other side made up of barbs that lock together through a network of smaller barbs called barbules. These also interlock, making ostrich feathers highly desirable for dusters. The very fine, soft barbs will not scratch furniture, and when rubbed to build up static electricity they will capture and hold dust until shaken out. Down feathers from other birds like the turkey have smaller, simple shafts or quills down the centers of the feathers with very soft and loosely spaced barbs on either side of the quills. Many housecleaning experts do not recommend feather dusters because they believe these dusters only scatter the dust or leave tiny fluffs of feathers. 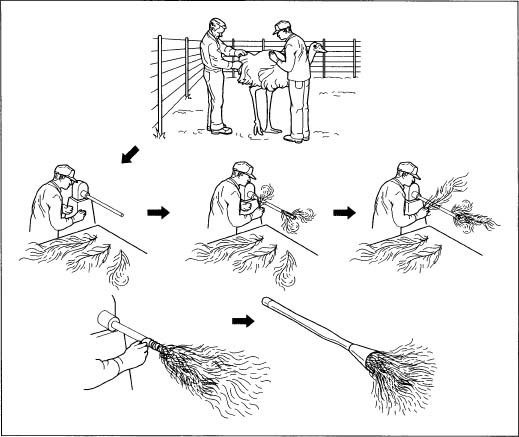 This is not true and shows that many people do not know how to use feather dusters properly. The buildup of static electricity is essential. It is the scientific property of the feathers that makes them trap dust, while the structural character of the feathers gives them enough tiny "fingers" to catch the dust. When the duster begins to leave dust or bits of feather, it should be taken outside and shaken to release the dirt. Like all handmade devices, the feather duster must be handled with care to prevent the feathers from falling apart. When feather dusters are used properly, they are more effective than most anti-static fabric dusters on the market. Brushes, dusters, and other cleaning equipment were simple and crudely made until the middle of the nineteenth century. Housemaids used dusters routinely, and feather dusters in the late 1800s and early 1900s were symbols of social status. The feather duster is a patented invention. The patent was awarded in 1876 to Susan Hibbard, who had to fight her own husband, George Hibbbard, in patent court because he claimed the invention as his own. Susan Hibbard's idea was prompted by seeing turkey feathers, which she thought could be useful, thrown away as waste. Other early feather dusters were made of goose feathers which were soft and sprang back to their shape. Feathers were also used to make small brushes for buttering loaves of bread to keep them soft; these were similar to modern basting brushes except that the use of feathers fell out of fashion. To make brushes for the hearth and the stove, wings still bearing their feathers from geese, chickens, and turkeys were popular "wing dusters," although they had to be kept from cats and dogs and were also meals for insects and moths. By 1900, dusters made of ostrich feathers were preferred for both light and demanding dusting because of their durability. South Africa is virtually the only place where ostriches are farmed for feathers and other products and where feather dusters are made. Feather dusters sold in the United States and other countries under the brand names of major manufacturers of home products are purchased directly from South African wholesalers. The plants in South Africa that make feather dusters both process the feathers and assemble the dusters. Ostrich feathers are plucked from live birds cared for on large farms of thousands of birds. These farms also produce leather and meat from separate stocks of ostriches. The birds have many layers of feathers for insulation that range in size from very short to extravagantly long. The processing and assembly plant receives the feathers in bulk shortly after they have been plucked from the farmed birds. Handles for feather dusters are either wood or plastic. Wooden handles are also made in South Africa and are received at the feather duster plant as finished products. Specialized suppliers use hardwood from several species of South African trees. Cured wood is cut into blocks of suitable lengths and dimensions and turned on lathes to shape the handles. Holes are drilled in the tops of the handles so loops can be added for hanging the feather dusters. After the handles are turned and drilled, they are sanded in machines that sand in several stages using finer and finer grades of sandpaper. Finally, the handles are stained and varnished. After drying, they are packaged and shipped to the feather duster plant. Plastic handles are made of Marlex plastic and are injection-molded at Asian plants. Other plastic parts include ferrules, the caps that fit over the feathers where they join the handles, and the hanging loops. Again, the feather duster maker receives these not as true raw materials but as supplied parts. Contact glue is purchased in bulk from a specialized glue manufacturer. Contact glue is semi-sticky and is not designed to be the only fixative that holds feathers on the handles. Low carbon steel wire provides the strong binding. The sizes of wire are described in gauges that are measures of the diameter of the wire. Feather dusters are made with 16-gauge wire, a relatively fine size equaling 0.001 in (0.03 mm) in diameter. A wire manufacturer ships the wire to the feather duster factory on large reels or rolls. The design of feather dusters made with ostrich feathers is almost unchanged since about 1900. Probably the biggest design change in their history was the production of some lines of dusters with plastic handles when plastic design improved rapidly after World War II. Some plastic dusters are made in retractable designs with hollow handles that slip down over the feathers. Feather duster manufacturers will make design changes specifically for clients. These special orders are made for companies like large janitorial services or suppliers. Design changes are more frequent for less expensive dusters made with turkey feathers. Usually, these feathers are dyed, and colors are changed occasionally depending on popular decorator colors. Handles for these dusters are modified in length and curvature to attempt to interest more purchasers. Foam grips on the handles are an example of a recent design change made to be both functional and eye-catching. Interestingly, the care of ostriches is a "design change" that manufacturers are beginning to practice. Ostrich feather products have very little value compared to meat and leather from the birds; meat production generates 200 times more income than feather-related manufacture. Consequently, farmers and manufacturers who maintain flocks of ostriches are learning how to improve feather production. Ostrich care has changed little since ostrich farming began on a large scale, also about 100 years ago. Typically, it takes 12-14 months for an ostrich's feathers to grow enough so they can be harvested. If the birds are given quality feed and improved attention at the farms, this time can be reduced to two months and feather quality also improves. Workers in the feather duster plant are now also paid far more than South Africa's minimum wage, so they invest more care in the plucking and processing of the feathers. Designs of actual dusters made with ostrich feathers may be forced to change in the future if costs of materials skyrocket. The feathers are plucked from the ostrich and then applied to the handle. area is denuded. When feathers are plucked from slaughtered birds, damaged or heavily soiled feathers and types of feathers that are not useful are avoided. After the best feathers are selected, the remaining feathers are stripped off and destroyed before the hide is removed for tanning and the meat is processed. Plucked feathers are delivered in bulk to the factory. They are washed, fumigated, graded by quality, and sorted by size. By the time the feathers are ready to be delivered to the duster assembly stations, they have been handled by at least 50 people. At each assembly station, about I oz (25 g) of feathers have been sorted by size and are ready to be fixed to the handle. The handle is held in a small, lathe-like device that the worker can turn as feathers are fixed to the handle. Contact glue is spread on the bottom end of the handle. The contact glue is not very sticky and does not dry with a firm seal. It is only a temporary method of holding the feathers in place until wire can be wrapped around them. After the first application of contact glue, the worker adds a small layer of short feathers. More glue is spread, and a layer of slightly longer feathers is put in place. The turning device keeps the handle rotating, more glue is applied, and a layer of even longer feathers is added. The process continues until all of the feathers previously sorted by length have been fixed to the duster handle. At each workstation, a roll of steel wire is mounted overhead above the turning device. As the layers of feathers are added, the worker wraps wire around the feathers already in place and ties and cuts the wire. Wire is not used with each layer, but it is applied several times during the process of building up the feather layers and after the last layer is added. After the final feathers and wire are in place, a plastic cap (ferrule) is pushed over the top of the feathers and wire. Covering the wire makes the feather duster more attractive, but the cap also prevents any wire ends from hurting the person who will use the duster. A plastic cap is used with both wood and plastic handles. In fact, the supplier packs a plastic cap with each handle so they are ready for assembly. Loops for hanging the duster are tied through predrilled holes or formed in the handles. Finished feather dusters are collected from the workstations and taken to the packaging department. Plastic sleeves are fitted over the feathers to cover them completely. The sleeves fit snugly but not too tightly to hold the feathers in place but not break them, and the sleeves are longer than the feathers so their tips do not get bent or broken. Other wrappings are put over the handles. Feather dusters are not packed and labeled for individual sale. Instead, they are packed in bulk in cardboard shipping boxes for distribution to consumers who use large numbers of feather dusters, like building maintenance firms and supply houses for janitors. They are also shipped to retailers who may change the packaging and add their own labels. The handles, plastic ferrules, and hanging loops are inspected before they are distributed to the assembly stations. The process of controlling the quality of the feathers is continuous because the 50 people who handle the feathers during the cleaning, sorting, and sizing steps are responsible for rejecting poor quality feathers. Inspectors observe all stages of feather processing and duster assembly. They intervene if they see inadequate materials or methods that the worker overlooks. The inspectors also perform final inspections of the finished feather dusters and look at each product before it is boxed. Production of feather dusters does not generate any byproducts although feathers themselves are harvested during other processing of products from ostriches, such as meat. Waste from the manufacture of feather dusters consists mostly of feathers. Over 50% of those plucked from live birds or saved from meat-producing stock are wasted because of damage or poor quality. Feather waste is disposed by burning, which is legal in South Africa. No wood or plastic waste is generated because these components are made by outside suppliers and are not trimmed or modified at the feather duster factory. There are also no metal trimmings from the steel binding wire or wasted glue except for minor spillage. Employees are also exposed to few hazards. Safety guards and emergency stops on the lathe-like turning devices prevent injury. The steel wire is enclosed in a plastic cover until it is near the handle that is being worked. The worker does not need to wear gloves to wind the wire on the handle although goggles are worn for eye protection because of the proximity of the wire. The glue is also inert and does not present hazards due to fumes or skin contact. Dust from feather processing is kept completely away from the duster floor, and, in the feather-processing area, it is swept up frequently and collected for burning with the other feather waste. Feather dusters are a tried and true type of product and steadily becoming more popular. Companies that use the most feather dusters and also the largest sizes available, such as janitorial suppliers, know these products work and have no interest in abandoning them for electrostatic or chemical products that are easily wasted, costly to replace and stock, and less efficient. The popularity of feather dusters among individual homemakers is proven by the sales of feather dusters in mass retail stores and grocery and drug store chains. Products in these stores must demonstrate specified minimum unit sales or they will be moved to less prominent shelf space or will no longer be sold by that retailer. A new use for the feather duster is in interior decorating. A feather duster can be used to apply contrast or accent paint to interior walls because the feathers produce a unique effect. Aslett, Don. Do I Dust or Vacuum First? Cincinnati: C. J. Krehbiel Co. 1982. Lantz, Louise K. Old American Kitchenware: 1725-1925. New York: Thomas Nelson Inc., 1970. Norwak, Mary. Kitchen Antiques. New York: Praeger Publishers, 1975. Patent, Dorothy Hinshaw. Feathers. New York: Dutton, Cobblehill Books, 1992. Edwards, Mike. "Marco Polo, Part III: Journey Home." National Geographic (July 2001): 26-47. Feather Dusters. November 2001. < http://www.geocities.com/felicitax/Duster.htm >. Ostriches On Line. November 2001. < http://www.ostrichesonline.com >. PBS Online. "Special Feature: Forgotten Inventors." PBS Online Web Page. November 2001. < http://www.pbs.org/wgbh/amex/telephone/sfeature/index.html >.